This article focuses on the history and current debates regarding global commodity markets. It covers physical product (food, metals, electricity) markets but not the ways that services, including those of governments, nor investment, nor debt, can be seen as a commodity. Articles on reinsurance markets, stock markets, bond markets and currency markets cover those concerns separately and in more depth. One focus of this article is the relationship between simple commodity money and the more complex instruments offered in the commodity markets. See List of traded commodities for some commodities and their trading units and places. 2.5 Is human life a commodity? 2.6 Is free time a commodity? The modern commodity markets have their roots in the trading of agricultural products. While wheat and corn, cattle and pigs, were widely traded using standard instruments in the 19th century in the United States, other basic foodstuffs such as soybeans were only added quite recently in most markets. For a commodity market to be established, there must be very broad consensus on the variations in the product that make it acceptable for one purpose or another. The economic impact of the development of commodity markets is hard to over-estimate. Through the 19th century "the exchanges became effective spokesmen for, and innovators of, improvements in transportation, warehousing, and financing, which paved the way to expanded interstate and international trade." Commodity money and commodity markets in a crude early form are believed to have originated in Sumer where small baked clay tokens in the shape of sheep or goats were used in trade. Sealed in clay vessels with a certain number of such tokens, with that number written on the outside, they represented a promise to deliver that number. This made them a form of commodity money - more than an "I.O.U." but less than a guarantee by a nation-state or bank. However, they were also known to contain promises of time and date of delivery - this made them like a modern futures contract. Regardless of the details, it was only possible to verify the number of tokens inside by shaking the vessel or by breaking it, at which point the number or terms written on the outside became subject to doubt. Eventually the tokens disappeared, but the contracts remained on flat tablets. This represented the first system of commodity accounting. However, the Commodity status of living things is always subject to doubt - it was hard to validate the health or existence of sheep or goats. Excuses for non-delivery were not unknown, and there are recovered Sumerian letters that complain of sickly goats, sheep that had already been fleeced, etc. Commodity and Futures contracts are based on what’s termed "Forward" Contracts. Early on these "forward" contracts (agreements to buy now, pay and deliver later) were used as a way of getting products from producer to the consumer. These typically were only for food and agricultural Products. Forward contracts have evolved and have been standardized into what we know today as futures contracts. Although more complex today, early “Forward” contracts for example, were used for rice in seventeenth century Japan. Modern "forward", or futures agreements, began in Chicago in the 1840s, with the appearance of the railroads. Chicago, being centrally located, emerged as the hub between Midwestern farmers and producers and the east coast consumer population centers. "Hedging", a common (and sometimes mandatory) practice of farming cooperatives, insures against a poor harvest by purchasing futures contracts in the same commodity. If the cooperative has significantly less of its product to sell due to weather or insects, it makes up for that loss with a profit on the markets, since the overall supply of the crop is short everywhere that suffered the same conditions. In addition, delivery day, method of settlement and delivery point must all be specified. 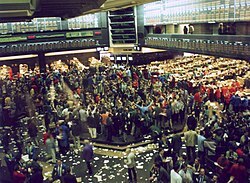 Typically, trading must end two (or more) business days prior to the delivery day, so that the routing of the shipment (which for soybeans is 30,000 kilograms or 1,102 bushels) can be finalized via ship or rail, and payment can be settled when the contract arrives at any delivery point. Similar specifications apply for orange juice, cocoa, sugar, wheat, corn, barley, pork bellies, milk, feedstuffs, fruits, vegetables, other grains, other beans, hay, other livestock, meats, poultry, eggs, or any other commodity which is so traded. The concept of an interchangeable deliverable or guaranteed delivery is always to some degree a fiction. Trade in commodities is like trade in any other physical product or service. No magic of the commodity contract itself makes "units" of the product totally uniform nor gets it to the delivery point safely and on time. Since the detailed concerns of industrial and consumer markets vary widely, so do the contracts, and "grades" tend to vary significantly from country to country. A proliferation of contract units, terms, and futures contracts have evolved, combined into an extremely sophisticated range of financial instruments. These are more than one-to-one representations of units of a given type of commodity, and represent more than simple futures contracts for future deliveries. These serve a variety of purposes from simple gambling to price insurance. The underlying of futures contracts are no longer restricted to commodities. The oil market is, however, an exception. Most markets are not so tied to the politics of volatile regions - even natural gas tends to be more stable, as it is not traded across oceans by tanker as extensively. Developing countries (democratic or not) have been moved to harden their currencies, accept IMF rules, join the WTO, and submit to a broad regime of reforms that amount to a "hedge" against being isolated. China's entry into the WTO signalled the end of truly isolated nations entirely managing their own currency and affairs. The need for stable currency and predictable clearing and rules-based handling of trade disputes, has led to a global trade hegemony - many nations "hedging" on a global scale against each other's anticipated "protectionism", were they to fail to join the WTO. There are signs, however, that this regime is far from perfect. U.S. trade sanctions against Canadian softwood lumber (within NAFTA) and foreign steel (except for NAFTA partners Canada and Mexico) in 2002 signalled a shift in policy towards a tougher regime perhaps more driven by political concerns - jobs, industrial policy, even sustainable forestry and logging practices. Most types of environmental economics consider the shift to measuring them inevitable, arguing that reframing political economy to consider the flow of these basic commodities first and foremost, helps avoids use of any military fiat except to protect "natural capital" itself, and basing credit-worthiness more strictly on commitment to preserving biodiversity aligns the long-term interests of ecoregions, societies, and individuals. They seek relatively conservative sustainable development schemes that would be amenable to measuring well-being over long periods of time, typically "seven generations", in line with Native American thought. In practice, political pressure has overcome most such concerns and it is questionable whether this is a capacity that depends on U.S. clout: The Kyoto Protocol established a similar market in global greenhouse gas emissions without U.S. support. Some economic systems by green economists would replace the "gold standard" with a "biodiversity standard". It remains to be seen if such plans have any merit other than as political ways to draw attention to the way capitalism itself interacts with life. Indian economist Amartya Sen, applying this thinking to human freedom itself, argued in his 1999 book "Development as Freedom" that human free time was the only real service, and that sustainable development was best defined as freeing human time. Sen won The Bank of Sweden Prize in Economic Sciences in Memory of Alfred Nobel in 1999 (sometimes incorrectly called the "Nobel Prize in Economics") and based his book on invited lectures he gave at the World Bank. This page was last changed on 11 July 2018, at 12:47.